My gosh, I just love the Goddess Victory Squat you do (upper and lower body toning is exactly what I’m looking for)! Can you recommend any other positions like this (hopefully, without having to get on the floor, or perhaps that I can do on a bed). I am so much overweight that it has become very difficult for me to get off of the floor (but I know I will get back to my fighting weight of 145 lbs). It may take a year or so, but I believe it is possible. This kind of question is one that I get often, how to do yoga with a gut, a stomach, when I am plus size, a big girl, overweight or pleasantly plump. Believe me, yoga is for every body. Every yoga posture can be modified and adjusted to fit your body, just as it is. You are perfect just the way you are. Yoga is an excellent practice for bodies of any shape and size. Today I am going to recommend two yoga poses to build strength as Michelle has requested. Chair pose and Warrior Two. This pose can be challenging for an overweight yoga student if you have knee issues. With knee issues you need to be conscious of good alignment from your ankles, to your knees to your hips. Additionally, extra flesh around your thighs and belly may limit your range of motion in this pose. Go as low as you can today in this pose with your knees pointing forward. Do what feels best for you today. Modification: You can turn your hips, knees and ankles out slightly (as long as they are all in the same line) to make space for your belly and thighs. This pose is great for overweight yoga students. There is lots of space for your full body expression. Pay close attention to the alignment of your pelvis if the weight of your belly starts to pull it forward. I have two class recommendations for your today. 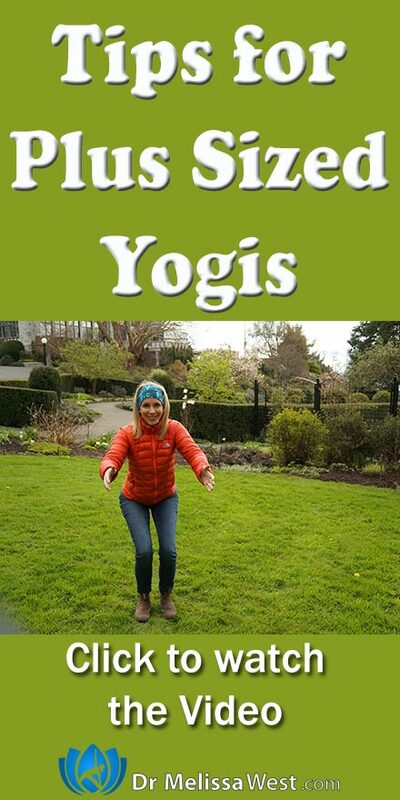 We also have a whole Yoga for Strength Building Series on our Membership site that is excellent. I would love to hear from you, what are your favourite strength building yoga postures that are easy to get into for overweight, plus size, ample, plump, lovely yogis. I would love to hear your tips. Please leave your comments below. If you liked this video give it a thumbs up and subscribe to our channel. If you know somebody who would appreciate this video, please share it with them.